Bloggers. Truth-tellers or vigilantes? Trophy-hunters or watchdogs? With the abrupt resignation of CNN chief news executive Eason Jordan, the American media are struggling with how to respond to bloggers. Some see the bloggers as an explosion of free speech, a democratic counterbalance to media arrogance and a much needed call for greater transparency in the media, while others see bloggers as vigilante partisans bent on discrediting and destroying the media. The furore was touched off after bloggers questioned comments Mr Jordan made at the World Economic Forum in Davos Switzerland about journalists killed in Iraq. At the forum, he said that he believed that several journalists had been targeted by the military. He was quickly challenged by many at the forum who thought he was implying that it was official US policy to target journalists. Mr Jordan qualified his statements saying that he was trying to differentiate between journalists who died as a result of being at the wrong place at the wrong time and those who were mistaken for the enemy. The salivating morons who make up the lynch mob prevail. 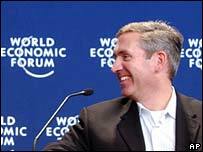 World Economic Forum policy is that all sessions are off the record, but blogger Rony Abovitz posted Mr Jordan's comments on a forum sanctioned website. Bloggers quickly set up a site calling for a release a transcript of the session, and Mr Jordan found himself in the middle of a blogswarm as the online pressure intensified. Mr Jordan attempted to qualify his comments publicly, but it was too late, and Mr Jordan abruptly resigned. But the mainstream media -the MSM in blog shorthand - fired back at the bloggers calling them "trophy hunters" and a "pseudo-journalist lynch mob". In a segment called "Old Media Lost in Blogosphere" on MSNBC, left-leaning commentator Bill Press condemned bloggers as people "with no credentials, no sources, no rules, no editors and no accountability." Steve Lovelady, managing editor of the Columbia Journalism Review wrote: "The salivating morons who make up the lynch mob prevail." "This convinces me more than ever that Eason Jordan is guilty of one thing, and one thing only - caring for the reporters he sent into battle, and haunted by the fact that not all of them came back," he added. Will Collier of the Vodkapundit was just one of many bloggers who fired back. "We see you behind the curtain, Lovelady and company, and we're not impressed by either your bluster or your insults," he wrote. "You, and Eason Jordan, and Dan Rather, and anybody else in print or on television don't get free passes because you call yourself 'journalists'," he added. 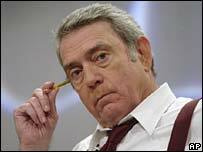 Dan Rather, long a target of conservatives, is resigning as the anchor of the CBS nightly news after the network could not vouch for the authenticity of documents he used as the basis for a story questioning President Bush's military service. Almost immediately after the segment aired, members of the conservative forum FreeRepublic.com were calling the documents forgeries and had reproduced convincing copies of the reportedly more than 30-year-old documents using word processing software. Conservative bloggers took up the cause and pressed for his resignation. Mr Rather had plans to step down before the document flap, but media watchers in the US say his departure can't be divorced from what became known as Rathergate. But amid the bluster, Jeff Jarvis, a media executive and the blogger behind Buzzmachine, said most bloggers just wanted more transparency not another big media scalp. "Bloggers didn't want his head, most of us didn't. We wanted the truth. We wanted to see that transcript from Davos," he said on CNN. One thing both bloggers and some journalists can agree on is that business as usual is over in the American media. "The MSM isn't over. It just can no longer pose as if it is The Guardian of Established Truth," wrote commentator Peggy Noonan in the Wall Street Journal. He suggested that Eason Jordan could have saved his job if he had responded better to calls for more transparency. He should have granted interviews to bloggers, Mr Rosen said. And some of the failures are simply down to journalists' lack of understanding of the web, he added. "If (CBS and Eason Jordan) had been literate at all in the internet, they would have saved themselves a lot of trouble," he said.